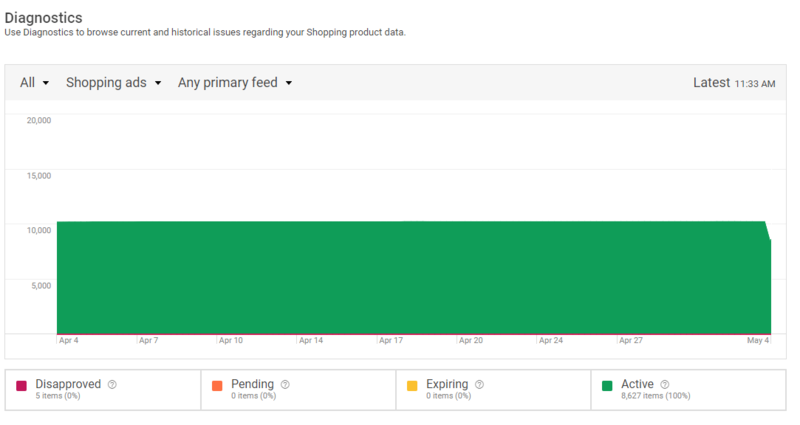 When our team of feed experts started noticing a decline in all our client’s eCommerce product inventory within the Google Merchant Center’s diagnosis panel, panic started to set in. How is this possible? After viewing the actual product containers, the product inventory numbers were correct. Did we just expose a bug in Google merchant center? Time to get hold of our clients Google Merchant Account managers. We urgently need to get to the bottom of this. So why should we be worried? Our company’s core service is product feed management and optimization. Our team works tirelessly to make sure our client’s feeds are perfect with dedicated support 24/7. Many of our clients will constantly be looking at reporting and diagnosis to evaluate their products performance, so you can just imagine the panic that filtered down to our team. I have an internal note that there is a system wide bug in the merchant center feed and they are in the process of urgently addressing. I’ll send through next steps/status ASAP! No update from Google just yet. We are sure they have a team rectifying the problem. Need Help with Your Product Feeds?